WISH THEM LUCK! -- At press time, Mitch Kistner and Mike Eyler were on their way to prefish the Arkansas River (pools 5, 6, and 7) from July 5-8. The actual competition is July 9-10, with the top five teams advancing to the third day. 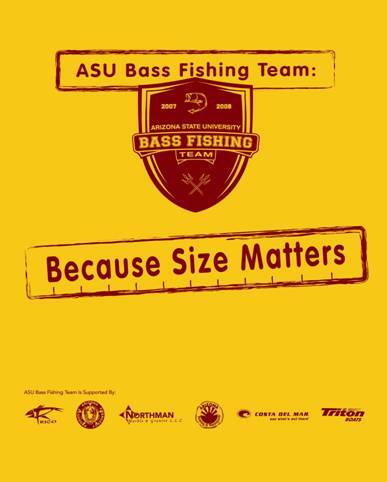 The ASU Bass Fishing team would like to thank some local companies who are making it possible for them to compete in the National Championships: Northman Marble and Granite LLC, AZ Boating and Watersports, and Arizona Emergency Products. Our other sponsors that have really helped the club are Rico, Costa Del Mar, Triton Boats, Mercury, and Kistler Rods. The team has new shirts to sell as fundraisers for the FOX College Sports National Collegiate Bass Fishing Championship in Lake Lewisville, Texas, in September 2008.